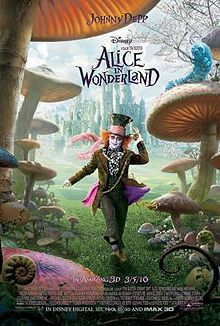 I love Tim Burton as a director, he’s my favourite, so I was more than eager to see this film. This film is amazing and to be honest, I think it is almost as good as the original Disney one…not better, no way, but it’s certainly a fantastic film. I thought that the special effects were amazing and the world of..Underland as they called it, I don’t know why…looked really real. I saw it in 2D, I don’t like 3D at all, but I would imagine that it looked amazing in 3D as there were quite a few flying scenes and things jumping out at you. The only thing I’d say is that towards the end it turned into a bit of Harry Potter and it sort of drifted away from the Alice in Wonderland story. I didn’t see much of a point in the huge monster which had a crazy name. Also, because of the Harry Potter style it lost some of the creepiness that I love about Burton…I’d have liked to have been a bit more freaked out…although there were some floating heads, so I was a bit woah at that. I loved the film, I really enjoyed it. I just wish it weren’t so darn similar to Harry Potter towards the end. Highly recommendable.